IXYS Integrated Circuits Division (ICD) announces the immediate availability of the IX3180 2.5 A Gate Drive Optocoupler. The IX3180 combines IXYS ICD's optocoupler expertise from its OptoMOS product line with its popular 600-Series of high current gate drivers. The optocoupler input is a light emitting diode which is then optically coupled to an integrated circuit containing a photo diode and high-speed, high current, push-pull power output. The IX3180 output is capable of providing 2.5 A of peak drive current, has a supply voltage range of 10 V to 20 V, and is specified over a wide –40 °C to +100 °C temperature range. The IX3180 has a high speed response time (100 nS typical propagation delay) and a 20 nS typical pulse width distortion. Under voltage lockout with hysteresis is provided for additional protection. The IX3180 is well suited for applications that need isolated drivers for fast switching power MOSFETs, such as DC/DC converters, industrial inverters, AC and brushless motor drives, inverters for solar cells, and uninterruptible power supplies. The IX3180 is the latest addition to IXYS ICD's growing family of high current gate drive optocouplers. 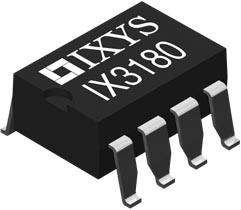 The IX3180 high current gate drive optocoupler augments IXYS ICD's extensive family of high current low side gate drivers (from 1.5 A to 30 A) and high voltage gate drivers (up to 700 V). "This driver complements our large range of driver IC's, that can be directly controlled by our family of MCU's to control the power MOSFETs and IGBTs in the whole spectrum of power conversion, motor control and medical application, where input to output galvanic isolation is needed. It fits perfectly in our 'World of IXYS' total solution initiative for our worldwide customers", commented Mark Heisig General Manager of IXYS ICD. The IX3180 is available in an 8-lead DIP package and an 8-lead SOIC package. The IX3180 is in volume production, and samples are available. Pricing for the IX3180 is $0.77 in OEM quantities of 10K units.